October 24th - 30th 2012: "Urban Regeneration in Germany - Principles and Projects"
The workshop "Urban Regeneration in Germany - Principles and Projects" was carried out by WANACU between 24th and 30th October 2012. The event was organized for TU Berlin's Iranian partner institution Maskansazan. The first workshop between both partners has been carried out in Berlin one year before this one. A second workshop - under the same title - in June 2012. 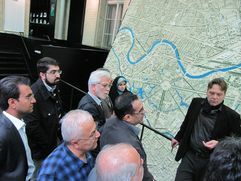 16 Iranien experts in urban planning and civil engineering participated in the workshop which included presentations, discussions and site visits.